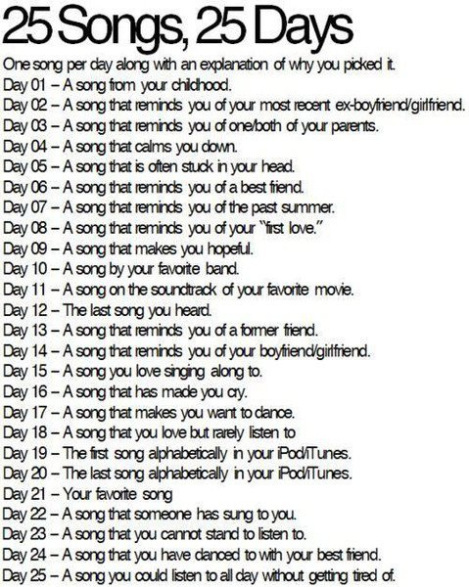 Day 4 – A song that calms you down. This isn’t so much a song as an entire album since the only proper way to listen to The Dark Side Of The Moon is from beginning to end in its entirety. Sometimes, when the world gets to be too much, I’ll put on this album and just listen. I turn off the lights or open the sunroof in my car and just listen. I don’t read or noodle on the internet or do anything else since The Dark Side Of The Moon is demanding of your entire focus. It’s a goddamn brilliant album. It really is. It’s rare these days to find an entire perfect album or even just an album where all the songs make a cohesive whole. Off topic, but how did you do the graphics in your sidebar with the multiple links? It’s a text widget with HTML, but I had to modify the CSS to get rid of the space between images. Ohhhhh……so it’s not really just one image? It just merely looks like it is? It’s one image that I sliced into many. Well have a listen to some of my albums. Especially Osaka Time and the new new one Manaus where Two Rivers Meet. Midnight in Manaus is peaceful with the saxophone. I wrote my post and picked one album myself, I then came here to read your post for Day 4 and intended to get your URL for the reference on my post. I was surprised that you also chose one album for this Day 4. And Pink Floyd is my brother’s favourite band. He was the one who recommended their songs to me as well as Radiohead. I think they are two of greatest bands in the world. IMO.